The week in review – January 9 to 15, 2015. Lots of soccer, some cricket, and a promise to the readers in this week’s wrap. Have you ever experienced FOMO? It stands for “Fear of Missing Out“, and describes a form of social anxiety where a person is compulsively concerned that one might miss an opportunity for some form of satisfying event. It’s usually associated with modern technologies such as mobile phones and social networking services – which is why some people feel the need to be constantly online. The reason I purchased tickets for Friday’s opening Asian Cup soccer game (at the de-sponsored “Melbourne Rectangular Stadium“) was somewhat along those lines. It wasn’t because of a deep seated love of our national team or any sense of loyalty – I simply figured that this was a major international event in Australia, and I didn’t want to miss out! 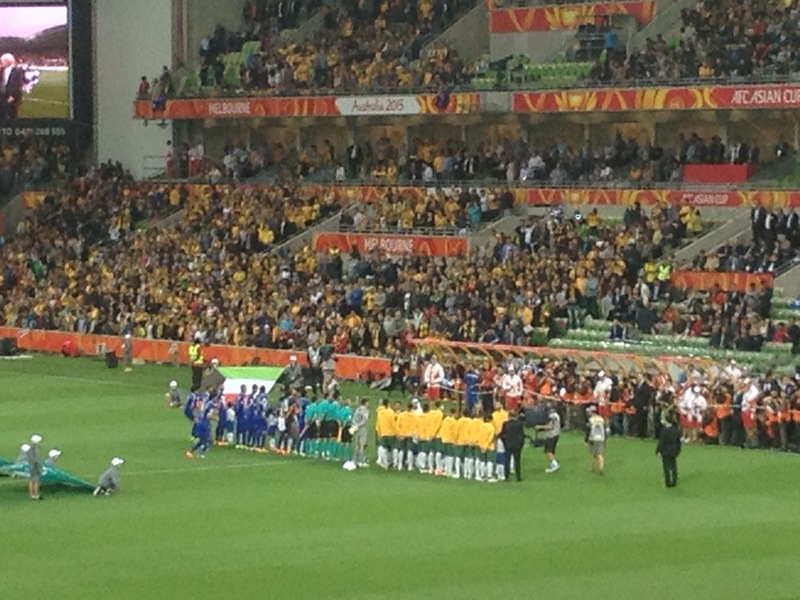 But in only a few days I’ve learned that the Asian Cup is about much more than just what the Socceroos are doing. This tournament is about people showing passion for their nation. When watching games on TV, I’ve loved hearing the noise that, for example, the Korean fans made in Canberra, and the Iranians in Melbourne, and thought “Damn, I wish I was there!” Not a “fear” of missing out, but a realisation that I was missing out – sports fan jealousy! “@j_foreigner: Goal Iran! 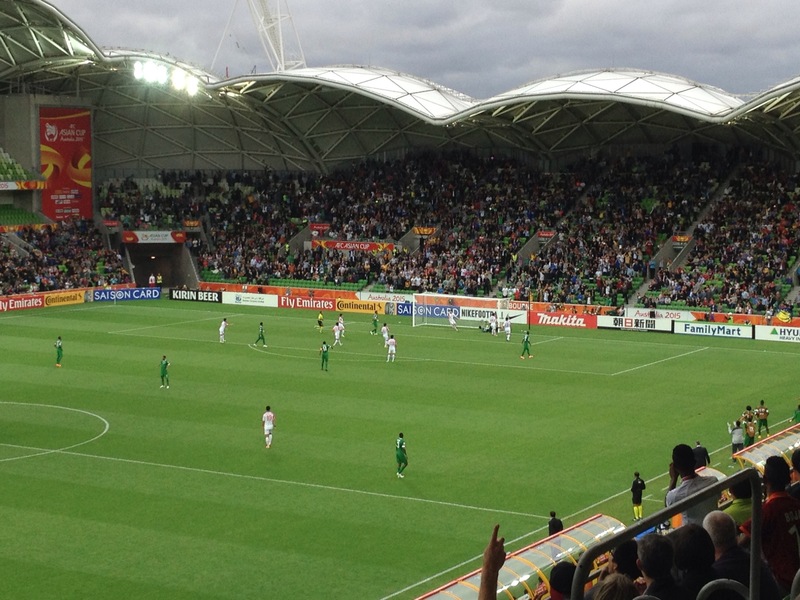 #IRNvBHR #AC2015 @AAMIPark http://t.co/FB16P8UsXU” Awesome video! Nothing special, but it got 32 “likes” on the night of the game and I obtained four new followers from Arabian nations – including messages wishing us well for the rest of the tournament. It’s been great to see the different Asian cultures on display up and down the east coast of Australia during the tournament. I was hoping to see people from two cultures I knew nothing about, apart from their, ahem, interesting political situations, and anything that featured in the movie Team America. The stadium was full of neutral fans but there were big pockets of Saudi and Korean fans at either end. The Korean fans were helped out by a large contingent of Melbourne Victory fans who had adopted North Korea for the night. Early on, the ball was pinging about all over the place – with heaps of tackling and near goal chances. It was a strange atmosphere as the neutral fans would cheer for whoever had the ball, hoping for goals. The fans of the competing teams really didn’t have much to say until DPR Korea scored and the Korean crowd clapped their approval. When the Saudis equalised, their fans waved their green flags and began chanting loudly in Arabic – this was where the atmosphere really lifted. The atmosphere wasn’t that great for people who had paid for premium seats on halfway – with the swirling winds the national flags hanging from the rafters needed to be lowered -they had to be evacuated for most of the first half!! In the second half, the play continued to be free and loose, with Saudi Arabia having plenty of chances – and then took one to lead 2-1. The third and fourth goals were comedies of errors – an attempted clearance by the goalkeeper went straight into the Saudi player, who then had the ball in front of him with no opposition, to safely tap in the goal. The fourth goal looked to be going in until the Korean player blocked it with two hands. Unfortunately, he wasn’t the goalkeeper… he was just another defender… so that was the end of his game, with a deliberate handball red card and penalty. when the penalty was taken, it hit both left and right posts before bouncing out, and then the penalty taker ran through to blast the rebound into the net, while at the same time also landing his foot in the goalkeeper’s nether regions. Ouch. By the end of the game it was somewhat comical as, with the result decided, the chanting Victory fans moved to the corner of the stadium and sang their Melbourne Victory songs with the lyrics changed (e.g. instead of “Melbourne Victory, our boys in blue” they would sing “North Korea, our boys in red”. the actual Korean fans loved it, and the Korean players warming up on the sideline clapped along. At the 80th minute, they parodied the Western Sydney Wanderers “Poznan”. Instead of singing “R.B.B. Ole Ole Ole”, they sang “Kim Jong Un, Ole ole ole”. So I didn’t really experience much about the two nations or their cultures – but I did have a lot of fun. I also went to the Big Bash League Melbourne Derby II on Saturday Night, taking along Renegades fan @simmogoesracing. There are plenty of things that I could write about – Wade’s hitting, Wright’s great catch on the boundary, Maxwell’s return to form. But the finish to the game was just crazy. 3 balls to go, Stars need 3 to win. Keath hits a ball into the legside. A misfield occurs, the Stars boys go for a third run (to win the game) but Keath is run out at the bowlers end. 2 Balls to go, Stars need 1 to win. Triffitt on strike hits the ball straight back to the bowler, who runs out Hastings for a diamond duck. 1 ball to go, Stars need 1 to win. Triffitt hits it to short mid on (Ferguson) and darts off for a run. Ferguson flicks the ball backwards and the stumps light up! The Renegades players celebrate. Simon gets out of his seat and starts chanting “Super over!! Super over! !” Joe recoils in his seat thinking “normally we don’t choke until the Semi Finals”. The umpire calls for the third umpire. The replay reveals that Rimmington broke the stumps before the ball hit them – so Triffitt was not out, and the Stars win! T20 continues to be great entertainment – and this was no exception! The weather was predicted to be poor so I didn’t book in to play golf on Sunday, but it turned out to be a beautiful day in the end so I went for a run instead. When our netball team received a win on forfeit on Thursday I went for another run. Stars v Scorchers at the MCG on Wednesday – hopefully sealing a Semi final spot for the Stars. This entry was posted in Cricket, Running, Soccer and tagged aami park, AC2015, asian cup, australia, big bash league, kim jong un, kuwait, MCG, melbourne renegades, melbourne stars, north korea, run for the kids, running, saudi arabia, socceroos, Tim Cahill, Twenty20. Bookmark the permalink.